IF YOU PROVIDE YOUR TELEPHONE NUMBER - WE WILL CALL YOU. We have opted not to use the shopping basket way of purchasing items. Although it is a quick and easy method, we feel that it a very impersonal service. From the onset, we decided to keep the relationship on a personal footing. We like the personal service - talking with our customers and answering questions. Most importantly, because of the very nature of Native American art - we did not want to let technology diminish and overshadow the special qualities of each handmade art piece. When talking about custom made items, we need to talk with you. Although we do stock some items, most of the items are custom made to order. On a custom made order, we require a 50% deposit to place you in the order line. Estimated delivery is subject to the orders already booked. Many of our customers are based in the States. Therefore, we advertise our prices in USD $. This provides our American collectors with very competitive prices, including our European and world wide customer base. European customers also benefit from the USD $ prices. Although most of the items are priced in USD $, customers in Europe and elsewhere - please use your current conversion rate to obtain the price in your currency. If you would like us to assist you to convert the price into your currency, please let us know. We ship items worldwide, so please request shipping and insurance costs for each item ordered. Estimated delivery dates for custom orders are just that - estimated. Orders can run a lot longer and sometimes much shorter than the estimated date provided at the time of order/deposit. This is due to events beyond Native Arts Trading's control such as health/illness, obtaining certain items for some orders, etc. Every item that we make is made with care and love and we do not rush any order. Native American items are spiritual pieces and the universe works in weird ways sometimes. We try our best to be on time, but sometimes a delay does happen on some orders. Returns will be gladly accepted if we are notified within 48 hours of receipt of the item, and it is returned in the condition in which it was sent. We will refund the full amount of the purchase less shipping and insurance costs. This does not apply to custom-made items. 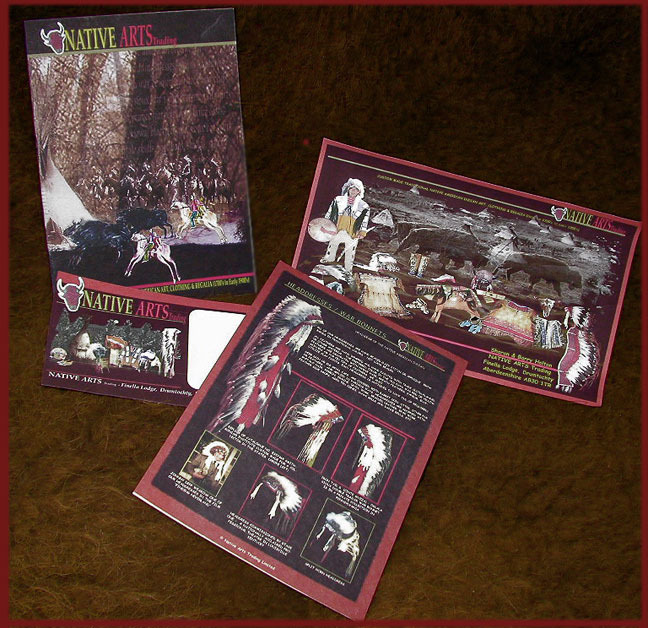 If you have any questions about any of the art pieces on our web site, or to find out the availability of an items, please either email us at cochise@nativeartstrading.com or telephone us on 011 44 (1561) 320914. We will call you if you provide us with your telephone number.